8m. 736 each: Bristol, Rutland. 704 Pudsey. 608 each: Cambridge, Lincolnshire, Superlative. 544 Yorkshire. 512 London. 130 changes of method. All the work. With best wishes to Beth Marsden; who left yesterday to spend a year working in Australia, and was nearing the end of her flight during this peal. Last updated Saturday, 26 September 2015 at 21:57:29. First submitted Saturday, 26 September 2015 at 19:33:18 by Peter J Waterfield. 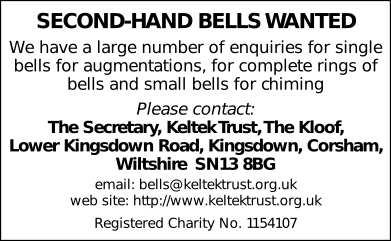 Sent for publication in The Ringing World on Saturday, 26 September 2015 at 21:54:57, and printed in issue 5450, page 1009. This performance has been viewed 960 times.